We are a well-known organization that is into presenting a wide assortment of PVC Letter. In order to retain remarkable position in this industry, we are providing a wide array of PVC Letter. - Used in offices, hotels, etc. Being a well-distinguished company in the market, we are into offering PVC Signage Letter. Owing to the wide experience of this domain, we are instrumental in offering PVC Sunboard Letter to our clients. We are amongst the well-known name of the industry of PVC Sunboard Letter. This product is extremely well-liked in the market owing to their sturdy nature and precise sizes. Our offered product is extremely utilized in the market for various purposes. This product is made by professionals who use latest techniques. Offering a wide range of PVC letters of 20 mm thickness with deco paint with 10 yrs colour waranttee. 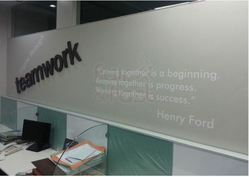 To make Aluminum, Brass, PVC 3D letters, we make use of high grade raw material such as PVC, brass, stainless steel. These are dimensionally accurate letters called Gemini letters for both indoor and outdoor use and it is durable and have smooth finish. We are recognized name in the industry, delivering quality approved array of PVC 3D Letter that ensures durable standards and have unique quality. Our clients can avail them in block and small letters and are used to engrave the complete name with perfection. To ensure consistency in results each alphabet goes for 4-5 numbers. 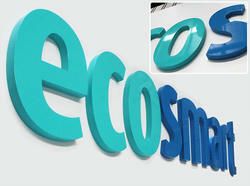 We are proficient name in the industry involved in offering optimum quality of PVC Letter.